After flying into Bangkok with Norwegian Airlines my connecting flight to New Delhi was with Malaysia Airlines. I decided to book a business class ticket to sample the famed chicken satay and the Malaysian inflight hospitality. The following flights are from Bangkok to Kuala Lumpur on a Boeing 737, and Kuala Lumpur to New Delhi on an Airbus A330. For passengers with special meal requests you may pre-order a special meal up to 24 hours before departure, and if you’re travelling in economy class on select flights, you can even upgrade your economy class meal by paying a fee to receive a more enhanced meal option. Customers in First and Business class on select routes can use the ‘Çhef on Call’ service that allows you to pre-order your choice of meal inflight. 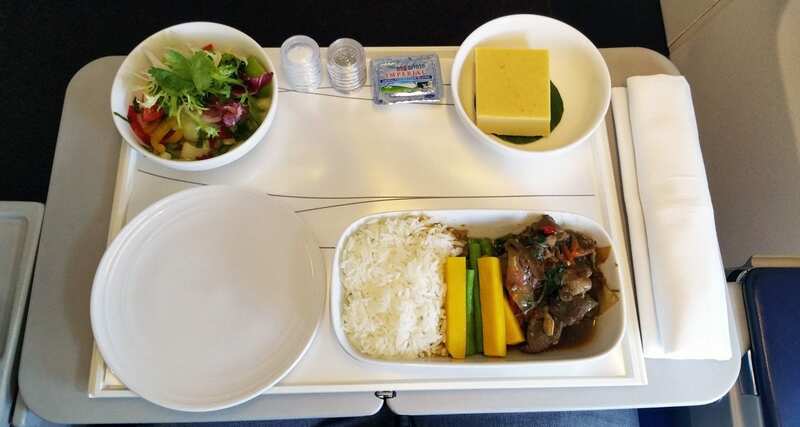 Further information on Malaysia Airlines meals can be found here. The flight time between these two cities was 1hr, and 45mins and the airline offered a full hot meal service in business class when you compare this offering to similar flight times in Europe you soon realise this is a class above many airlines flying within the EU. Meal 1- Chilli beef with steamed rice and vegetables. From KL to New Delhi the flight time was just over 4.5hours, hot towels, menus, peanuts and drinks were served before the start of the inflight meal service. 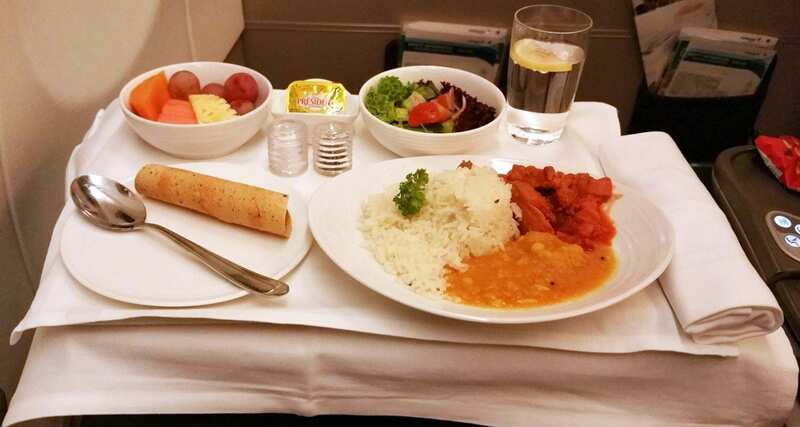 The inflight service consisted of an entree service, main meal service and hot beverages. 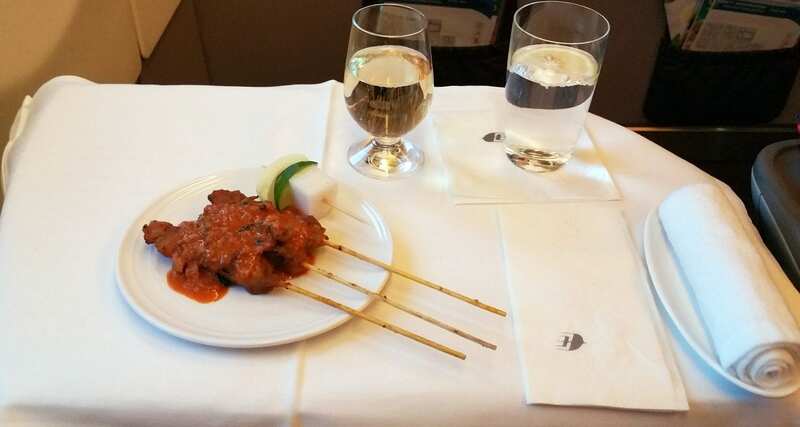 The satay served onboard Malaysia Airlines is something that has become a signature dish of the airline. Fresh shallots, turmeric, garlic galangal and lemongrass are all part of the secret to making this dish. The airline has served satay onboard flights since they commenced services and since 1973 have been produced in-house, every day 20,000 sticks of satay are enjoyed by Malaysia Airlines passengers around the world! Meal 1- The famed chicken satays on Malaysia Airlines! Yes, they were delicious. Charcoal hand grilled chicken with peanut sauce. Since we were flying to India I thought it was best to get into the swing of things, so I chose the Indian inspired main meal option. There were three meal choices on this flight: Chicken Makhani, Grilled garoupa with herbs and meuniere sauce and Peneer Makhani. My choice? The Chicken Makhani! Meal 2 – Chicken cooked in cinnamon, clove, ginger and nutmeg, jeera rice and lentils. Yum! Champagne: Philip Royale Reserve Brut NV, France. White Wines: Domain Minet le Bois Chaud Pouilly – Fume 2014 and Loire and Olivier Leflaive Bourgogne Chardonnay 2012, Burgundy, France. Red Wines: Chateau d’Arche 2009, AOC Haut-Medoc, Bordeaux, France and E.Guigal Crozes-Hermitage 2010, Rhone, France. Service on both flights was okay, not amazing but not terrible either; the crew were engaging and did their job, but were not overly friendly on either flight. The meal offering on the short flight between Bangkok and KL was more than adequate for the flight time, and it tasted great too. The main Indian meal on the flight between KL and New Delhi was excellent and full of flavour I guess because so many spices were used when creating it, it’s always a great idea to take the meal that has the most spice. Why? Spicy foods work so well at 35,000ft that’s why India curries and other Indian dishes can still taste so good up in the air. Of course, my favourite part of the entire MH inflight experience was sampling the chicken satay dish, it was indeed was a great meal and lived up to my expectations.